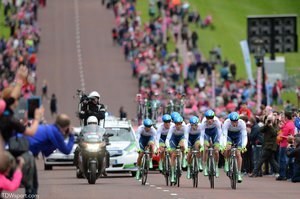 The Giro d'Italia 2014 opened with a 21.7km Team Time Trial in Belfast, Ireland. The late afternoon racing was threatened by rain and wind, but SRM sponsored team, Orica-GreenEdge, found themselves with the right conditions and team power to win the stage in a time of 24:42. Luke Durbridge's SRM race file below illustrates the physical demands of an elite team time trial performance. Luke, racing at 78kg, won the 2012 Australian National Time Trial Championships, and in 2013 won both the time trial and the Australian National Road Race Championships. His 2014 season is off to a powerful start with today's TTT victory adding to his win at the Oceania Road Race Championships and a 2nd at the National Time Trial Championships. The Amstel Gold Race runs a total of 251 kilometers through the Netherlands and features 33 climbs as it twists and turns over narrow roads through small villages and massive crowds. 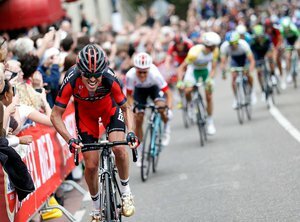 This year it was BMC Racing Team's, Philippe Gilbert, who launched a solo sprint to the finish line and claimed his 3rd Amstel Gold victory. Gilbert credited his team - especially teammate, Samuel Sanchez, for perfectly executing the set up for his win. "They all did a very good job to place me in the best position," Gilbert said. "During the briefing, it was planned for Samuel to do an attack at the foot of the Cauberg. It was not a surprise for me, but I think it was one for my adversaries. I only had to wait for the best moment to attack. And I did that when it was most difficult and hurting for everyone." 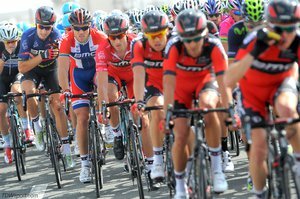 The performance team at BMC Racing Team provided the SRM race file from Sanchez who races at 181cm/68kg. The benefits of using a Power Meter are widely known and in the Professional peloton it’s rare to see a rider train or compete without some kind of data gathering device attached to their bike. At the BMC Racing Team we use the SRM Training System for the simple fact that it is the benchmark by which other power meters are measured. Its accuracy and reliability has been proven to us in extreme environments over many years of collaboration and as cycling enters this new age of science-based training, meaningful data is becoming one of the most important determinants of continued success. However it’s what you do with this information that can really make a difference. The following is a brief insight into how we are using SRM data to develop our riders along a logical physiological pathway; where the individual components of endurance, strength, power and speed are addressed with the appropriate dose delivered at the right time. 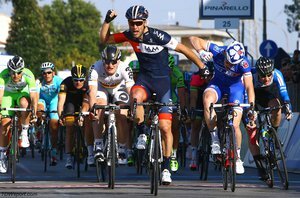 March 13, Stage 2: San Vincenzo - Cascina 166km IAM Cycling's Matteo Pelucchi seized the moment in the Stage 2 sprint finish, taking the win over some of cycling's strongest sprinters. The 25 year old Italian road professional, with a background on the track, demonstrated his strength and skill as a sprinter after picking the perfect line and crossing just ahead of Arnaud Demare and André Greipel. Matteo, racing at 1m82 with approximately 74kg, shared his SRM race data to illustrate the early season demands of Tirreno-Adriatico and his efforts required to win the day's sprint.